Postcards from the Road: Tote Bag Edition Series 001 — Blake Erik. With postcards in tow, and knowing I needed to diversify and expand the product line, this was a natural step— tote bags. Every now and then I get people who have bought cards from me send me a picture of where they've placed it in their house or office as decor, or the fact that their friends got the cards and returned positive feedback, and that, I can honestly say, is one of the most fulfilling things for me. So totes, I might go into drawstring bags or even smaller pouches next, but that'll be a while away, and here I've curated 5 photographs for Series 001 of totes, and like with every other product or series I've launched, I'll be talking about them here and why I took these photos in the first place. Edit: Ever since the launch of the tote bags, the brand has grown into several more lines of postcards, tote bags, notebooks and tumblers. Where I grew up in Asia, thrift stores / vintage clothes shopping aren't really a thing, instead the general public taking more to mega shopping mall meccas with a slew of international brands under one roof. So you can imagine my love for these vintage clothing stores when I made the move to Barcelona, Spain at 19 years old. These stores exuded cool; glossy marble floors were swapped with wooden floors with fancy carpets, an almost mechanical way of displaying clothes in neat rows and columns turned into narrow walkways lined with racks on either side crammed with as many clothes that could fit as possible, neon lit signs hung above the ceilings, and the shoppers themselves were cool. Flamingos Vintage Kilo is a chain of thrift shopping / secondhand clothing stores dotted around Spain from Barcelona to Madrid to Valencia. In this particular store in Barcelona, I found a neat record collection tucked away in a corner, and there's something about vinyls for me and the way they are packaged and presented, that feel so much more like an experience than the age of CD, or perhaps even the cassette (even though the latter is also experiencing a small revival). Flicking through vinyls is like going through someone's very own personal collection, and even if I wasn't leaving the store with one, I had to at least get a picture of one. Here's to all the music lovers. Shop the Vinyls in a Vintage Store Tote Bag here! Nara's a small city in Japan these days more known for their deer than their historic past, and who can blame them? These deer roam around the lush space of Nara Park with not a single care in the world, and in the day can often be found dozing under the covers of a tree, mindlessly prancing around as if not swarmed by a million tourists and their cameras. As would come as no surprise, the deer only really perk up if the humans bring the food, and in the case of this park, that would be the deer biscuits sold on push carts. Truth be told, I don't really know how I got this picture— as in, I don't know how I managed to get a moment where they were all lined up in formation running into the distance under the cloudless azure blue skies. Remind me to never lose this photo. Shop the Chasing Deer in Nara Tote Bag here! Trams are not a locomotive completely unique to Lisbon, but these days it seems more cities have done away with them than embraced them the way Lisbon has. Chances are, if you've seen a postcard, a cover of a travel brochure or magazine displaying a scene in Lisbon, I wouldn't be surprised if there was a tram on it. These days 28E is a route that appeals to tourists, traversing through the hills of the oldest parts of Lisbon, often saving the traveller the energy and the effort traversing through these inclines and declines. I didn't though, I just used it as a regular form of transportation if that was going to be the mode to get me to a certain place, not unlike the locals these days, who probably don't pay all that much to the fact there are trams. So while I was walking the streets, often times a tram would roll past, and this time I managed to get that perfect shot of Lisbon, with beautifully aged buildings on either side of the roads, locals going about their daily business and the road on my side clear, giving me a perfect shot of the tram. Shop the Another Day in Lisbon Tote Bag here! Oh look, another photograph of flowers from the Hunter Valley. Honestly though, they really were stunning on our road trip into the countryside during our trip to Sydney, and I really loved the way so much of nature seemed almost completely untouched, but yet it felt like flowers and shrubs were perfectly groomed. At one of the wine yards we were at, we had arrived just after it closed, so we stood there and took in our surroundings in the Valley, and I noticed this large shrub of flowers just blowing in the wind. If Boomerang or DSCO had been a bigger thing back then, I would've taken multiple ones, but all I have of this scene now is this photograph, but I'm glad there's obvious motion in the picture, and weirdly it just imbues me with this sense of calm. Shop the Hunter Valley Flowers Tote Bag here! Located in the district of Montmartre are the historic attractions of Moulin Rouge and Basilique du Sacré-Cœur de Montmartre, and the latter was where I was headed on this particular day. From here I managed to walk through some of the most quintessentially Parisian streets lined with bakeries and boutiques. 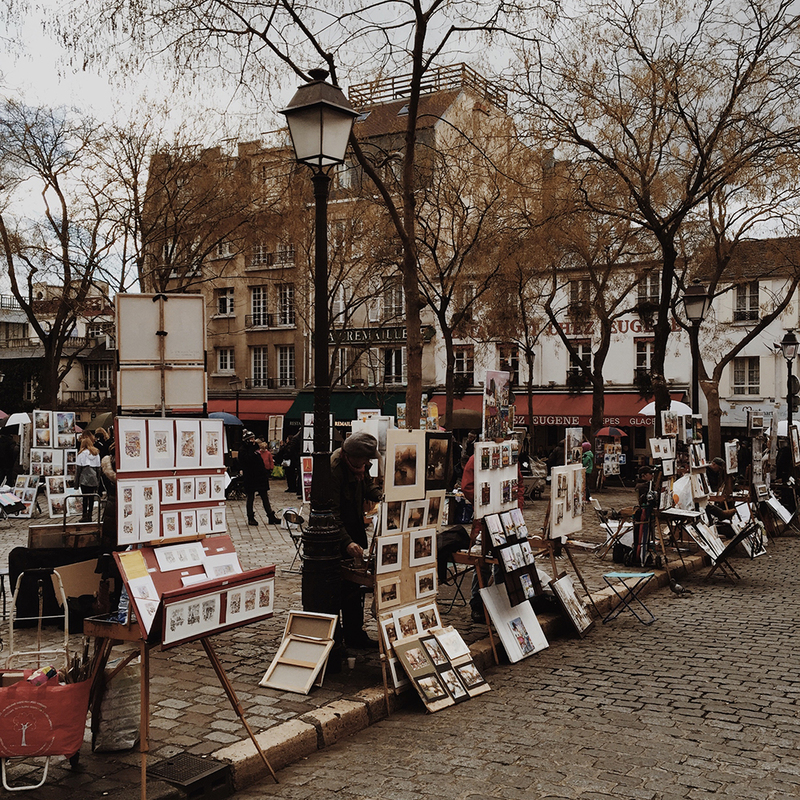 That day, I managed to stumble on this square that had an open air art market, where locals with a flair for the pencil and the brush set up stands on this square to share and sell their craft. As I took this photograph, all I could think to myself was that there is literally nothing I can do to make this photo more Parisian apart from shoehorning a silhouette of the Eiffel Tower in the background. Paris is definitely one of those cities so shaped by arts and culture that it's become an extension of the city and its inhabitants, and is one I wouldn't mind spending a longer time in. Shop the Art in Montmartre Paris Tote Bag here!